The title of this book is quite provocative, inviting a potential reader to be unsure what he is going to think about it. Everyone knows that Christopher Hitchens was the champeeeen professional wrestler of atheism—no less aggressive than one of those guys, and quite a bit more articulate. So what could possibly be meant by the faith of Christopher Hitchens? Faith? What faith? Was this going to be the evangelical equivalent of a kiss-and-tell? A witness-and-tell? Breathless inaccuracies about a death-bed conversion? Or perhaps it would be a self-serving promotion of an apologetics ministry from a Hitchens platform. How well behaved were the Christians in this book intending to be? As indicated, when I picked it up, I was quite prepared to be interested, but didn't exactly know what I was going to think about it. But now I do know what I think of this book, and I am concerned that I might exhaust my supply of superlatives. 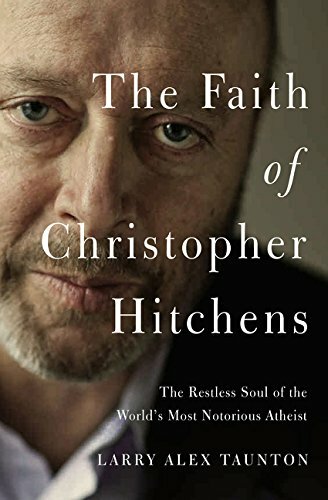 This book was written by a man who knows God, knows his Bible, knows the way the world works, and knew Christopher Hitchens. This book is simply outstanding. There, my first superlative. Larry Taunton meticulously makes his case and does so from the published works of Hitchens himself, his public statements, and Taunton's eyewitness testimony. And as far as the eyewitness testimony goes, I can say that his account rings completely true. The man he traveled with and debated is the same man that I traveled with and debated. So Taunton makes his case superbly, but what is his case exactly? Whatever else it was, the word daunting needs to enter into it. To begin with, Taunton—very deftly in my view—deals with the legitimate concern that a book like this is in dubious taste. "I did not want to betray any confidences the way it seems friends and acquaintances of celebrities so often do." At the same time, Christopher had been excruciatingly open (which is not necessarily the same thing as being honest) about many matters that are usually kept private, and so if we are going to talk at all about Christopher Hitchens with any degree of integrity, then it will take someone as fair-minded as Larry Taunton to do it. Taunton exhibits a real affection for Christopher as a man, leaves certain things unaddressed for specified reasons, refuses to airbrush out the marked blemishes he does address, and does everything in the light of the gospel of grace. Fewer things are sadder than the death of a defiant atheist, without hope and without God in the world, and yet Larry Taunton tells this melancholy story wonderfully, with truth in his right hand and hope in his left. I can't imagine anyone doing this better. The observations that Taunton makes about Christopher's "relationship" to God are dependent on two basic facts—one psychological and the other biographical or historical. The psychological one is the open pride that Christopher took in keeping "two sets of books"—one for his public life and the other for his private life. So let's begin with that. Taunton dedicates a separate chapter to the theme of these "two sets of books." One of Hitchens' published works was entitled Letters to a Young Contrarian, and the contrarian streak in him is generally well known. That much is expected. It goes without saying that Hitchens would be a contrarian toward whatever he thought were the "smelly little orthodoxies" that Orwell once wrote about. He could outrage the faithful by attacking Mother Teresa, to take one famous example. But he could also from time to time keep the orthodox unbelievers on his own team off balance. Taunton discusses, for example, an essay entitled "When the King Saved God," in which Hitchens extravagantly praised the King James Version of the Bible—"he loves the language of the Tyndale and King James translations, and loathes any attempts at modernizing it." (p. 32). As it happens, as one who loves the King James myself, after that piece appeared, I wrote Christopher and thanked him for it. He wrote back, "I'm so pleased that you liked it. There are gold standards, and they hold their value." This was the predictable contrarian—an atheist praising the King James Version of the Bible. Take that. But (keeping the idea of two books in mind) Hitchens was also a contrarian to himself. His public persona was contradicting the conventional views he found all around him, conventional believers and unbelievers both, but that public persona was also contradicting a much more reflective Christopher, one who was considering certain ultimate questions much more carefully than he could afford to let on. As Peter Hitchens once told me, the reason Christopher's city walls were so heavily armed, bristling with weaponry, was that if you ever got past those walls there were no defenses from there to the city center. So the biographical element has to do with two dramatic turnings in his life. There were (of course) inconsistencies and contradictions associated with these turnings, but they were still highly visible for all that. The first was his turn away from the political left in the aftermath of 9/11, and his resultant and very public support for George Bush and the "war on terror." This resulted in Christopher being thrust out of his leftist bubble, whereupon he discovered that not all conservatives were idiots. They had better not be, since Christopher was associated with them now. The second turning followed his publication of God Is Not Great, his famous anti-religion screed. Christopher, to his credit, asked his publicist to arrange for the publicity tour for the book to be one in which he took on all comers in debate. Rather than release the book at some Manhattan soirée, the kind of event that is sufficiently godless already, Christopher issued a challenge saying that he would debate anybody who wanted to debate him. This is how Taunton came to meet Christopher—having arranged a debate between him and John Lennox. Later on Taunton himself came to debate him, and acquitted himself quite well in it. But how is it a "turning" when a notorious atheist simply continues on with his atheism, throwing down the gauntlet for believers to pick up? How is an atheist publishing an atheist rant a turning? One of the things that Taunton's book makes very clear is that Christopher issued this challenge with mixed motives. One was for the sake of the debates themselves, the kind of event that Christopher "liked having," and that part was plain enough to everyone. But the other motive was that it enabled him to associate with Christians in a way that would simply be impossible otherwise. If you are the enfant terrible of atheism, you can't just start going to Bible studies. It would arouse comment. Your atheist fan club would go sideways. In fact, as The Faith of Christopher Hitchens makes clear, Christopher had to do a lot of explaining even with the ingenious cover he had. The challenge to debate all comers is how I got to meet Christopher as well. My son-in-law was at that time getting his DPhil at Oxford, and during one of our periodic visits over there, we got acquainted with Peter and Eve Hitchens—delightful Christian people, by the way—who were friends with our daughter and son-in-law. We hit it off, and a few weeks later, my agent responded to Christopher Hitchens' challenge by contacting Christianity Today to see if they would be interested in an online debate between Christopher and me, which they were. Christopher then agreed, and we were off. So within the space of a few weeks, I was engaged with both Peter and Christopher in ways that were completely unrelated. It was almost as if there was a higher power at work. My online interactions with Christopher resulted in a book (Is Christianity Good for the World?) and then a documentary (Collision) was made about our book-release tour together. Part of that involved Christopher and me flying from New York to Philadelphia in a helicopter. I remember telling Christopher that my faith in God was obviously genuine because I was getting into that thing with him. In all these interactions, the same kinds of things were going on with us that Larry Taunton records. As Taunton writes his experiences, I can hear the timbre of Christopher's voice. And this book is pitch perfect. For anyone interested in Christopher Hitchens' life, this book is a necessary one. For those who have had only a passing acquaintance with his writing, this book will nevetheless be fascinating. Students of apologetics could benefit from it. Ministers will be strengthened and evangelists encouraged. I still have some superlatives left, so I will simply conclude by saying that I wish more Christian books were like this one. Top drawer. While Christopher would treat certain private things very publicly, he was also very reticent about other things. He really did keep two sets of books. After he was diagnosed with the cancer that would take his life, in late 2010 I emailed him a brief note, but one that contained a lengthy attachment. I told him that I would not ever know if he read it or not, but that I wanted him to have it. On the one hand, I did not want to harry or harass him. I said, "The fact that someone has a life-threatening cancer ought not to be taken as an open invitation for Christians to act like aluminum siding salesmen on commission." But on the other hand, I told him it would be a shame if he didn't read it because it contained some "really fine prose," as in, some "hot stuff." In that attachment, I laid out the gospel as plainly as I knew how, addressed to him personally, in his condition. No one is saved because we think it would be grand if they were. Good wishes and pious guesses cannot cleanse what only the blood of Christ can cleanse—and the blood of Christ does nothing for the unrepentant. But from my interactions with Christopher, I did know that it was quite possible I had an attentive audience. From Larry Taunton's book I have received the additional encouragement of knowing that the audience was clearly more attentive than I knew. Douglas Wilson is pastor of Christ Church in Moscow, Idaho, and a faculty member at New Saint Andrews College.